Timothy HorseHage is produced in the same way as HorseHage Ryegrass and High Fibre, but is made from Timothy grass which has a very different ‘nose’ to ryegrass, and is slightly softer in texture. horses and ponies that are resting, convalescing or prone to laminitis. 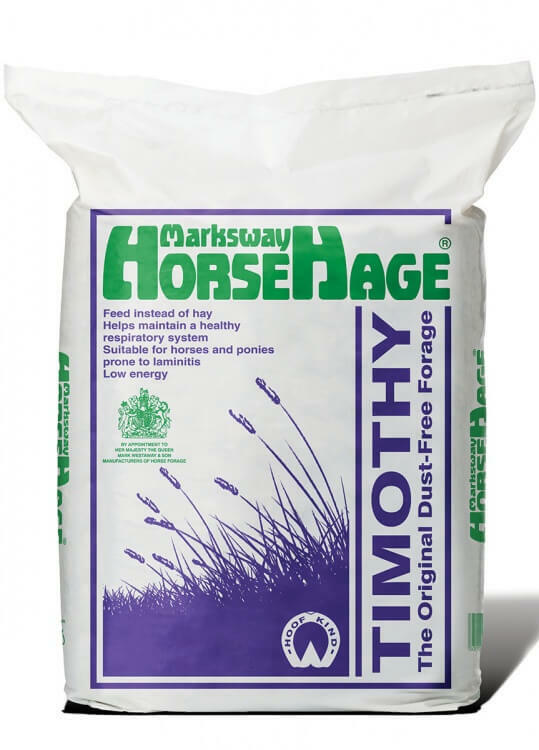 HorseHage Timothy has a similar nutrient analysis to High Fibre HorseHage and is highly palatable, making it ideal for fussy feeders or simply to add variety to the diets of those already being fed HorseHage. Being particularly low in sugar and starch and high in fibre. Timothy HorseHage and also High Fibre HorseHage are suitable for feeding to horses and ponies prone to laminitis. This is indicated by the HoofKind logo on their packaging. HorseHage Timothy is known by many of our customers as ‘HorseHage Purple’ because of its bag colour. HorseHage Timothy is usually deep gold in colour and contains the characteristic, cylindrical timothy seedheads. It tends to feel softer in texture than High Fibre HorseHage and has its own timothy smell, compared by some to the smell of tea.